These feast days happen on the 1st and 2nd of November respectively. I never celebrated or even knew about them until I became Catholic almost 10 years ago. But they are days to remember the saints and all the dead (respectively) and much has been written about them, in particular, some important music. Every time I attend a concert with art song I promise myself to read more poetry. This space in the liturgical year to remember those who have gone before us has been usurped by Hallowe’en. But there is a need to honour the spiritual bond between those of us on earth and those who have gone before. 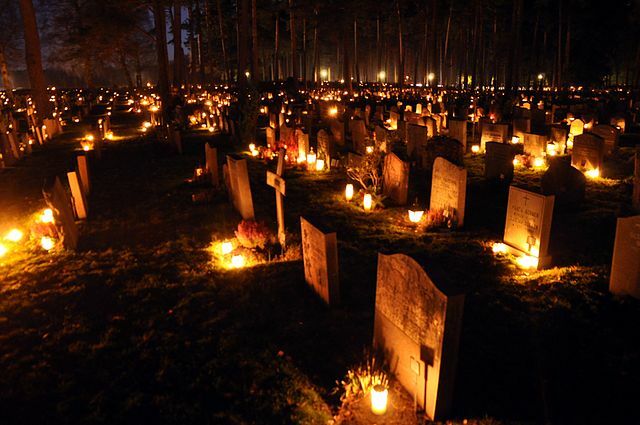 Catholics believe that there is efficacy in prayers for the dead, and at this time of year, we are reminded of our obligations to those who have gone before us. Oh blest communion, fellowship divine! As we move into the month of May, my parish choir presents songs to Mary. This has to be one of the most beautiful choral pieces ever written, and was apparently Rachmaninoff’s favourite composition. We sang this on Sunday and below is a version sung (by men only) by the Westminster Chorus. When Philip Fournier sings a line of Gregorian chant, it hangs like a puff of smoke in the air before it slowly dissipates above the empty pews below. The sound, listening to it live from a distance of just several inches away in the choir loft at St. Vincent de Paul Parish in Toronto, is ancient, elemental. The sound originates in his abdomen — a line of text that flows out like a wave, sung in tones that are dark and rich. The words are in Latin. It is not a song so much as prayer that is sung. Mr. Fournier, with his ragged sweater and perpetual five o’clock shadow, is part of a small cadre of traditionalists for whom singing Gregorian chant is an attempt to restore what they see as the real music of the Catholic Church — sounds that go back to the time when King David sang psalms in the temple. If they had their way, they would storm the parish churches and hurl all the guitars and drums into the street because they believe substituting modern music for ancient music has eroded worship. I’m a huge chant fan, although realize that to encourage congregational participation in the novus ordo mass, we need to sing familiar hymns and (re-)inroduce these more traditional forms slowly. Both of the parishes I have belonged to since I became Catholic moved to Latin mass parts for Advent and Lent, and my current choir uses a lot of renaissance (and some medieval) music during the offertory and communion periods. We are also (apparently) ordering the Parish Book of Chant and this should go a long way to including more chant in the liturgy. I missed choir last week due to illness, but I was happy to be back today, particularly since both of our pieces were by Duruflé. During the Offertory, we sang Ubi Caritas. Here’s the Chor of King’s College Cambridge…. Then, during Communion we sang Duruflé’s Notre Pere. These pieces are stunning in their harmony and forward movement, and are a joy to sing. While I’m excited to be travelling to England in the next couple of weeks, I’m sorry to not be singing with the choir over the Easter weekend. …the anthem we sung during the Offertory yesterday. William Byrd’s Teach Me, O Lord, sung here by the Hereford Cathedral Choir. Gorgeous modulation during the Gloria (about 2:30). We are blessed with a terrific parish choir, comprised of a combination of professional singers, musicians, and keen amateurs. Our rehearsals are the hour and a quarter before mass, where we spend our time preparing the days hymns, choir-only pieces, and work on music for upcoming weeks with remaining time. We rehearse in a room in the lower level of the church building, and then in the quarter hour before mass, we have a break, robe, and head up to the loft at the rear of the nave during the organ prelude. Today’s rehearsal went quite well. We prepared Francis Poulenc’s Salve Regina for the Offertory and Jesu, Dulcis Memoria (Tomás Luis de Victoria) for Communion. I wasn’t completely firm on some of the difficult intervals in the Poulenc, but it was 98% good. Singing from the loft is such a pleasure. The difference in the sound between our enclosed rehearsal room and the soaring space in the church is huge. We also stand in a semi-circle around the organ console when we sing and the acoustics are quite different. As a result, our efforts typically sound much better when we actually “perform”. (I realise that’s not the correct word to use during mass….) It was no exception this morning. I joked to one of my colleagues that I got intervals in the Poulenc during mass that I hadn’t managed to get during the rehearsal. It’s always a pleasure to finally hear ourselves singing from the loft. The presider spoke about the Church’s newest saint, the first male saint born on Canadian soil, Brother André Bessette, now Saint André of Montreal. Father quoted Saint Augustine’s recommendation to “Pray as if everything depends on God, and work as if everything depends on you.” I think that will be my maxim for the upcoming week. I have a lot of catching up to do. Monday Miscellany – last sprint before we leave. I have been a bad blogger, but it’s been a little frantic around here as we have one boy in exams, one man in high work stress, and one trip to Paris (this Thursday) to prep for. The trip doesn’t really feel real, I was remarking to Z last night. We were in Rome barely three months ago, and Paris was booked very quickly due to my mother-in-law’s health issues. Because we will want to spend a lot of time with her, we’re not doing our usual planning for day-trips and excursions. We’re just heading over there with our bags and our prayers. Alex and I will return after eight days as he starts his summer camp job later this month. Michael will stay on with his father for another week and do some touring, likely St. Malo/Mont St. Michel and then the chateaux de la Loire. One of his cousins may join them, and a convertible Golf has been offered up, do it should be a fun road trip for the guys. Last week was busy. We saw the Eagles with Dixie Chicks Tuesday night and it was a great concert. I was surprised to see Natalie Maines with a very short haircut. They did some of their hits, some less familiar music, and a cover of Train’s “Hey Soul Sister”. The Eagles played a long set, packed with hits and a very 70s vibe to the staging/video. We were in a corporate box, so quite far from the stage in the Rogers Centre, but it was a great show that had everyone in the house singing along. On Friday, I headed to Stratford with some gals from the choir to see The Tempest. We had a picnic by the lake with napping swans and ducks around our feet, saw the show and then dined at The Church before heading back to Toronto. It was the first public performance of the Tempest, which has it’s media opening in a couple of weeks, and it was a stunner. Apart from a few sound issues (we had trouble hearing some of the actors when their backs were to us), it was stacked with talent and was received with an instantaneous ovation. It was lovely getting to know these ladies a little better, and it was a farewell to one of the long-standing members of the alto section who is moving to Stittsville. The Parish choir is winding down for the year….two more Sundays of singing (of which I’ll miss next week while we’re away) and then we close for the summer. So we’ve been pulling out some familiar music. This Sunday, we sang Brahms’ Lass dich nur nichts nicht dauren (pdf) and John Sheppard’s sublime The Lord’s Supper (pdf). I’ve joined another choir for the summer and we rehearse on Monday nights. I’ll miss the next two rehearsals, one while I’m in Paris. On June 28th I have tickets to the National Theatre’s live broadcast of the play London Assurance which I purchased months ago, before I joined the choir. Before we leave, I need to finish up one of my genealogy courses, complete a CWL newsletter for our parish bulletin, get the house in order, pay some bills and do all the laundry before we pack. I’ve done all the newspaper cancellation/dog boarding stuff so it’s really the last minute things that are on my mind now. Plus supervise study time for Michael. He writes his last exam on Thursday morning, and we leave that evening. I may not be back before we leave, but I’ll try to post some photos while we’re away. The choir sounded quite wonderful yesterday! It never fails to amaze me how much better we sound from the loft compared to the rehearsal room in the basement of the church, particularly with certain types of music. This week, we sang Josquin‘s 4-voice Salve Regina during the offertory and Jesu Dulcis Memoria (Tomas Luis.de Victoria) during communion (pdf). They are simply thrilling to sing. I can’t find a video of the Josquin, but here’s one of the latter. But above honey and all things Is His sweet presence.